I've been recharging my batteries on Otres beach and having a great time with the people staying at Moonlight rock. Wish I could stay at this paradise beach forever but it was time for me to start moving again. 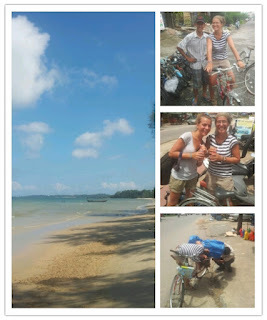 I met Perrine and Jennifer, 2 lovely Belgian sisters and they decided to join me to Phnom Penh. They decided to buy an extra bike and join me on a little adventure. Some friendly Cambodians who happened to pass us when it happened immediately pulled over with their tractor-ish transport. They offered us a ride to the first bicycle shop. Well, this was really a lot of fun. I pulled out the guitar that I got from my Argentinean buddy Santiago (I got one lesson from him so no I don't know how to play :-) ) and we started to sing some songs. Our drivers were very amused by this and didn't stop laughing. The tractor moved slowly but steadily towards our destination. A small bicycle shop. The look on their faces when they saw their new clients was priceless :-). They replaced the inner tire and off we went... but we didn't make it very far. Just maybe 10 meter further I got another flat tire. 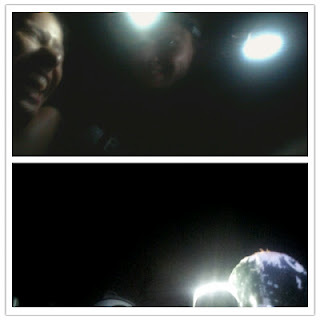 We headed back and hilarity all over. They didn't had spare tires so they fixed the THREE holes Cambodian style. Never seen this before. They have this device that they put on fire and then melt another piece of tire to the pierced one. After 3 inflating attempts all was good to go again. Jennifer saw that they sold mountain bike outer tires and I decided to put one of those on the back wheel since Cambodian roads are a bit more bumpy. 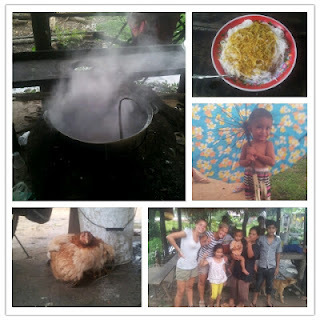 By this time a few hours passed and we got hungry. A bit further we saw a house with a boiling kettle. We thought it was a kind of road resto so we asked for food. They invited us in but it was clearly just a family that just ate. Nevertheless they still just offered us a nice meal. We had some laughs and played a bit with the kids. We than offered them money for the food but they didn't want to accept it. Such generous people! They waved us off hitting the road to Kampot. After that everything went pretty smooth until we got to this 'new' road to Kampot which was just opened. Riding this road was like cycling on the moon! Many loose rocks and some serious craters that we had to slalom through. Everything went a bit slower and day turned into night. 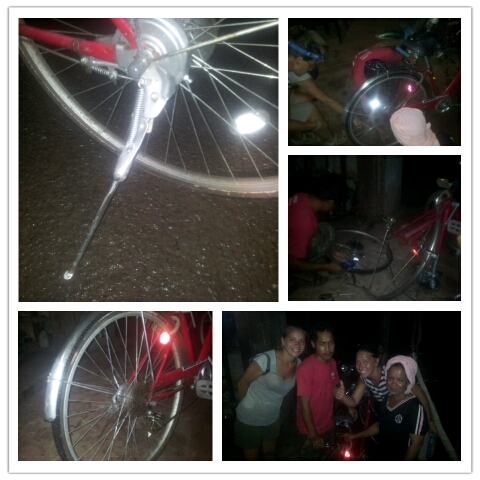 It even got more tricky to avoid all the obstacles and yes... another flat tire! This time it wasn't on my bike but on Jen's. So there we were, on a deserted road with hardly any traffic in the dark, in the middle of nowhere! We then just started to walk back direction the last houses we saw. First place was some kind of a bar where drunk locals tried to scam us into paying ridiculous money for a taxi. After some animated talks we moved on to the next house. Here we found a bunch of women having a chat. They immediately got up and tried to explain that they know a guy that can help us. They looked very ok so we followed them away from the main road via a small dirt road. We passed the local mosque and finally arrived to a small muslim bar where one of the men was called out to help us. This guy was apparently the local bike mechanic and he had his tools in the corner of this bar. How convenient! He immediately started working on the bike and fixed it in about 10 minutes. Pure awesomeness. 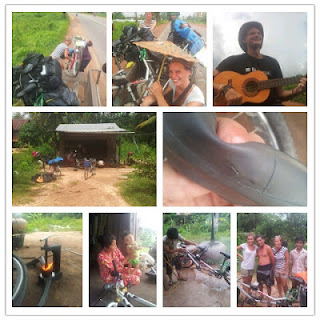 We thanked everybody, jumped back on the bike and found our way back to the main road. We still had about 30 km ahead of us and this on a pitch black rocky cratered road. Slowly but steadily we continued and the further we got the less houses we saw. You don't want to get a flat tire again in the middle of nowhere. After some time we got really skilled in this rocky slalom and made it to a much better road.